EDIT: See the latest post for details. Prepare to be disappointed. 1) I'm using KDE and I haven't changed my networking configuration since a year ago, when everything was working perfectly fine. I use wpa_supplicant, iwconfig, and dhcpcd to connect and setup my network. I normally can't get the wireless connected unless it's through the network management GUI by KDE. If I'm constrained to the terminal I use the ethernet port. I don't know if this has to do with the problem, but it's been that way since I've installed Gentoo. 2) Things will be fine until randomly while I'm browsing the internet, all traffic will halt. I'm still connected and authenticated to my wireless network, but I just don't receive packets from my router anymore. When I ping something, nothing happens. If I ping my gateway, it'll show packets being sent, but nothing is ever returned. It will remain this way indefinitely, even if I reboot, clear configuration settings, etc. I can reboot into windows 7 and connect just fine at any time. 3) If I log into the gateway administrator page, I can see a list of IP addresses and the devices that have leased the IP's. I can see my window's device listed and then a device that has an IP address, but no hostname. I can refresh this list of leases and the blank entry goes away. After this, my wireless network will receive traffic again from the router. When I view the admin page when everything is working, I get my win/linux entry listed but no blank entry. Wait about an hour, and then go to step 2, where everything starts all over again. The admin page will look similar to this. 192.168.1.4 is my wireless network. When I'm in windows, it shows up with my windows hostname and when I'm in linux, it shows up using my linux hostname. 192.168.1.2 is the mysterious empty entry. It's usually 192.168.1.2, but I've had multiple blank entries, using 192.168.1.9 as well. I wonder if anyone with the same router as me is familiar with this phenomenon? 4) I suspect that this means the network layer is doing something odd to affect the configuration of the router? FEATURES="assume-digests binpkg-logs config-protect-if-modified distlocks ebuild-locks fixlafiles news parallel-fetch parse-eapi-ebuild-head protect-owned sandbox sfperms strict unknown-features-warn unmerge-logs unmerge-orphans userfetch xattr"
Aug 30 22:21:09 localhost NetworkManager: <info> Activation (wlan0) Stage 1 of 5 (Device Prepare) complete. Aug 30 22:21:09 localhost NetworkManager: <info> Activation (wlan0/wireless): connection 'System ([ssid])' has security, and secrets exist. No new secrets needed. Aug 30 22:21:09 localhost NetworkManager: <info> Activation (wlan0) Stage 2 of 5 (Device Configure) complete. Aug 30 22:21:13 localhost NetworkManager: <info> Activation (wlan0/wireless) Stage 2 of 5 (Device Configure) successful. Connected to wireless network '[ssid]'. Aug 30 22:21:13 localhost NetworkManager: <info> Activation (wlan0) Stage 3 of 5 (IP Configure Start) scheduled. Aug 30 22:21:13 localhost NetworkManager: <info> Activation (wlan0) Stage 3 of 5 (IP Configure Start) complete. Aug 30 22:21:18 localhost NetworkManager: <info> Activation (wlan0) Stage 4 of 5 (IP4 Configure Get) complete. Aug 30 22:21:19 localhost NetworkManager: <info> Clearing nscd hosts cache. Aug 30 22:21:19 localhost NetworkManager: <info> Policy set 'System ([ssid])' (wlan0) as default for IPv4 routing and DNS. Aug 30 22:21:19 localhost NetworkManager: <info> Activation (wlan0) successful, device activated. Aug 30 22:21:19 localhost NetworkManager: <info> Activation (wlan0) Stage 5 of 5 (IP Configure Commit) complete. As far as I know, there's nothing out of the ordinary from the above... A successful connection for me looks identical to the messages above. It would be nice to check that. First, you might get some clues in the log files. When this happens, try using ctr+alt+F12 to view your messages and see if anything stands out. use ctl+F7 to get back. Another good check is to bypass where you think the problem is. You should use wpa_supplicant to connect directly. You can do this in two ways. 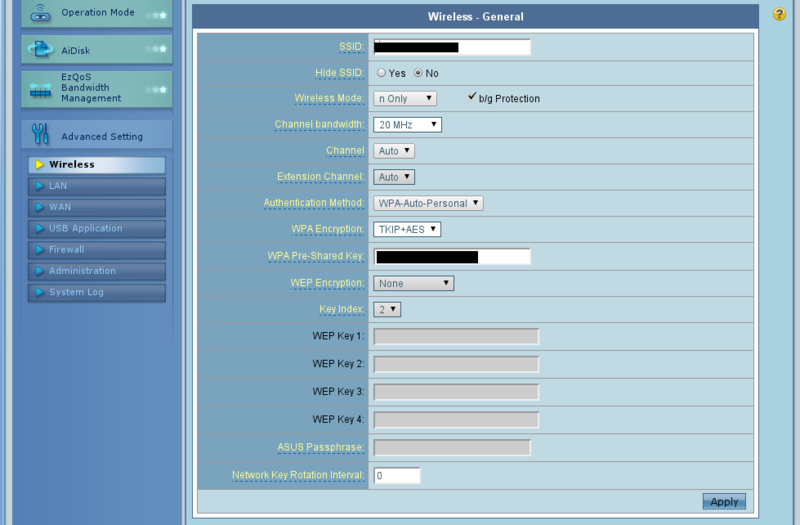 1) configure wpa_supplicant. I recommend following The Arch Linux guide as it is easier to understand than the Gentoo documentation. For me anyway. 2) setup a WEP network and see if the problem persists and if using wpa_supplicant directly solves the problem. This might be easier, but its more indirect. Option 1 is preferred since I assume that your standard network is not WEP. You will also need to either turn networkmanager off and manually start wpa_supplicant for this to work. If that works, then it is probably a bug in network manager. The solution might then be to mask the current version in your package.mask file. If this does not work then the problem is likely kernel related. It is possible that firmwere and/or the kernel module have changed. I see that NetworkManager 0.9.4 has dropped wext. This could be the problem,, but I really don't want to point fingers where none are due. Is it possible that the 0.9.4 update coincides with your problems? EDIT: I just check bugs.gentoo.org and 0.9.4 went stable on August 16th of this year. Does this sound like the time you started experiencing problems? Also, if this is a bug with networkmanager it has not been reported yet. It helps us if you make a new post with new information as we don't get alerted to edits. Well, it looks like there is nothing obvious in the logs. That might mean that networkmanager is not at fault or it does not know it has a problem. I don't see any red flags there either. Anything new using wpa_supplicant to connect? Hi Doctor, I put the relevant network messages in the OP. It looks to me like everything on my computer is working and I am legitimately connected to the network, but my router just refuses to send packets or communicate to my computer. Could it be a problem with DNS resolution or IP conflict? My money would be on a firewall that is not Linux friendly. It looks like we can scratch off my idea about a bug in the new version of networkmanager. You still are not running the new version. If you want to rule out DNS or IP, you can try using networkmanagement to set static ones. I don't use it so I don't know the exact procedure, but it should be easy enough. I would set DNS to 8.8.8.8 or 8.8.4.4 to use Google and 192.168.1.42 for your ip address. I'll see if I can figure out how to set static IP addresses. I'll do that now. It might be that what you have works, but it seems odd that wpa_supplicant can't connect using it directly. The static IPs should be very easy to set in the graphical environment. It might be under some type of advanced config option. I think we've made some progress! I had to reset the router so I didn't encounter the issue again until just now. I changed my wpa_supplicant.conf file to match what you have written down. I now seem to have intermittent and extremely slow access to the internet. (But my router is now exchanging packets with my computer!) Does this sound like a familiar problem? Here is the result of me trying to ping my gateway and then google.com. I get severe packet loss with long latencies. Also, my MTU is 1492 bytes. PING google.com (74.125.224.130) 56(84) bytes of data. Good news: GUI software is not the problem. Bad news: you seem to have a deeper problem. I don't know enough about networks to really see what it is or were to go from here. One thing to try is ping -c 5 www.gentoo.org to see if you really are loosing lots of packets or just cutting of ping before it gets them back. Also, unrelated to the above, could you explain what those options in wpa_supplicant.conf do? I'm just curious, since I've never really looked into those topics before. This is, of course, when my computer is between sporadic disconnections. hmmm. I'm afraid I can't explain it. I recommend consulting the man pages. I just noticed this too: NetworkManager is causing wlan0 to repeatedly reconnect. I think might explain the slow packet thing. That it would. If you feel like taking a risk, you might try updating newtorkmanager to the newest unstable version or downgrading to the last stable version. I really appreciate your help, Doctor! I'll continue to look into the problem and hopefully I will be able to mark it solved sometime in the near future. In that case, maybe you can downgrade. Mask the current version and the last stable version should be pulled. Authentication with f4:6d:04:9f:e2:60 timed out. Sep 15 19:17:46 localhost NetworkManager: SCPlugin-Ifnet: global:wpa_supplicant_wlan0-"-Dwext"
Sep 15 19:17:46 localhost NetworkManager: SCPlugin-Ifnet: updating wireless security settings ([essid]). Sep 15 19:17:46 localhost NetworkManager: SCPlugin-Ifnet: updating wireless security settings ([old network]). Sep 15 19:17:46 localhost NetworkManager: SCPlugin-Ifnet: updating wireless security settings ([another old net]). Sep 15 19:18:00 localhost NetworkManager: SCPlugin-Ifnet: global:wpa_supplicant_wlan0-"-Dwext"
Sep 15 19:18:00 localhost NetworkManager: SCPlugin-Ifnet: updating wireless security settings ([essid]). Sep 15 19:18:00 localhost NetworkManager: SCPlugin-Ifnet: updating wireless security settings ([old network]). Sep 15 19:18:00 localhost NetworkManager: SCPlugin-Ifnet: updating wireless security settings ([another old net]). I noticed that before, it would be like I only had a certain amount of data I could transfer, before all traffic would cease and I'd need to reset everything. Because of this, I'm not sure that the issue is gone, but I have been streaming video all day (best way to tell) and I haven't encountered it yet. Due to the three messages in the above post, I thought it might be something wrong with my microcode (sys-firmware/iwl6000-ucode). Now I think it had to do with the kernel itself. Looks like all my packets are being ACK'd as soon as possible and most of those messages are gone now. Good job, Linus and team, I guess! My router settings are still the same as last post. Marked solved. Thank you, the Doctor! You were a real big help! EDIT: Okay, so almost immediately after I posted this, I rebooted my computer and somehow my wireless connection quality deteriorated to almost their original state. It's not as bad, because I never actually lose connection permanently, but I have heavy intermittent periods of severe packet loss. I am extremely frustrated with this right now. I've worked on this problem alone for a couple of months now and my entire few years experience with gentoo has been constantly dogged with wireless problems. I really hope that this problem is solved, but I think I'm going to give up for now. I'm sorry. EDIT EDIT: I can no longer receive packets using Linux. I've rebooted multiple times. I should have knocked on wood. I'm losing my mind here. FINAL EDIT (PROBABLY): Looks like I overreacted... Well, I think the problem is fixed. I went to bed and then when I got back from work the next day I booted my computer up to see how it was doing and the connection was back to full speed. I guess I needed it to "cool down" somehow?? Well, I think now, the symptoms are that the kernel module or ucode or something crashes occasionally. I fixed the problem by disconnecting and re-associating. There may be a more severe crash where it requires a "cool down", because the state of my computer one edit up was no traffic even across reboots. I can actually start working on something interesting now, so it's good enough for me! Here's logs of the crash. Please notify me if you think I should file a unique bug report. Thanks! Sep 17 23:53:23 localhost kernel: [ 771.665032] hda-intel: IRQ timing workaround is activated for card #0. Suggest a bigger bdl_pos_adj. Sep 18 00:06:05 localhost kernel: [ 1531.777894] iwlwifi 0000:10:00.0: Queue 11 stuck for 2000 ms.
POST FINAL EDIT: I think I might have this: http://syntaxionist.rogerhub.com/intel-centrino-wireless-n-2200-ubuntu-1mbps-workaround.html. Trying this in a little bit. I think I found the problem, for real. (Knock on wood.) I was fooling around with iwlist and looking at the various access points in the area and I noticed that almost everyone was using Channel 1 for their networks (2.412 GHz, I belive). I switched my router configuration to use Channel 5 (previously, it was set to automatic, which favored channel 1 for some reason...) and immediately my speed picked back up. I still confuses me that Windows handled this perfectly while Linux had some trouble since this fix was on the router side. It's been working for a full day and I've rebooted it. * I changed the ap_scan parameter from 2 to 0 in wpa_supplicant.conf. I don't know why it was set to 2, but I read on the ubuntu forums that some times wpa_supplicant stumbles if ap_scan isn't 0. I did this before I switched the channel and it appeared to have no effect. * According to the new gui, I'm always on the b/g band? I switched my router settings to use b/g mixed with "b/g protection". The stability and speed issues seem gone, but I'm back to b/g speeds. I don't really notice a difference anyway, so I guess that's a nice somewhat long term fix. Hopefully, this is the last post I'll make in this topic. I now consider this to be truly [SOLVED].